Jenny Muncaster graduated from Winchester School of Art in 1988 with a BA Hons in Printed Textiles. She works from The Colour Factory Studios and Gallery in Winchester, which she set up with fellow artist Linda Miller in 1994. 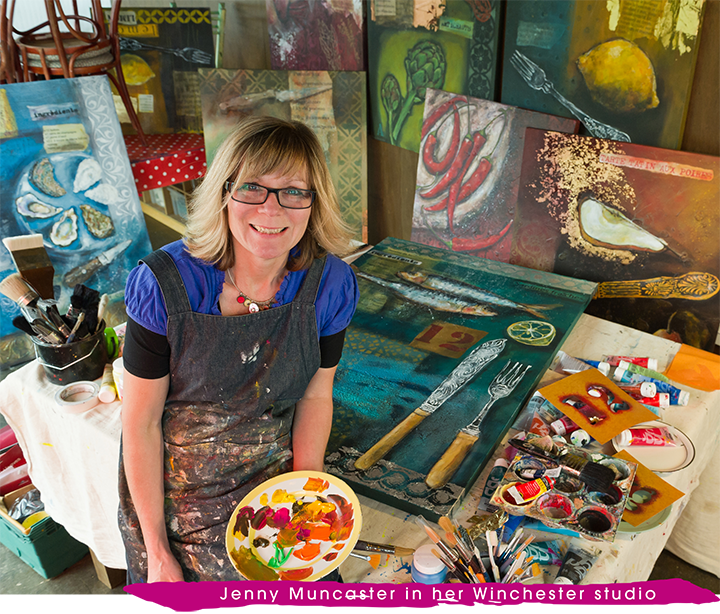 We asked Jenny to tell us a little more about her practice in mixed media painting. Can you tell us a bit about what your creative process looks like? More times than not my creative process is done with speed and a sense of urgency to try and capture whatever it is I am working on. 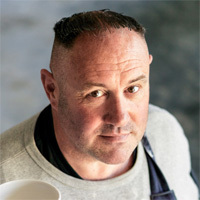 The studio will be crammed full with pots of paint, acrylic colour squeezed out on to plates, a number of different paint brushes all of various sizes and sorts, water spray, sponges, cloths, a hairdryer and all sorts of auxiliary painting products, papers and paste. I get frustrated if I don’t have everything to hand! Sometimes ideas for particular projects fester for a good year until I have proper time to give them to really be experimental. This is a different approach to painting commissions for clients, which are a lot more structured as I follow a brief and complete them to deadlines. All I ever wanted for birthdays and Christmas was the latest art and craft kit or any art product going. Painting and drawing as a child is full of good memories, my mum saved a fortune on greetings cards as she would just ask for a little drawing or sketch to make into a card and I loved doing it! What is the best part about creating art using mixed media? Getting to know the various properties and how best to push the boundaries with the materials. Different acrylics, for instance, have very varied structures. Some you can use finely for real clarity and detail and others you can use almost like emulsion paint, throwing it on to the canvas for great effect! I love the idea that watercolour, for instance, doesn’t mean just ‘traditional watercolour’, it actually defines any painting medium that mixes with water rather than solvent. I believe a direct response to the art materials themselves can be an inspiration for creativity. What do you wish you’d known about mixed media before you got started?